If you want your audience engaged, the energy high and your people raving about your event, Simon’s for you. 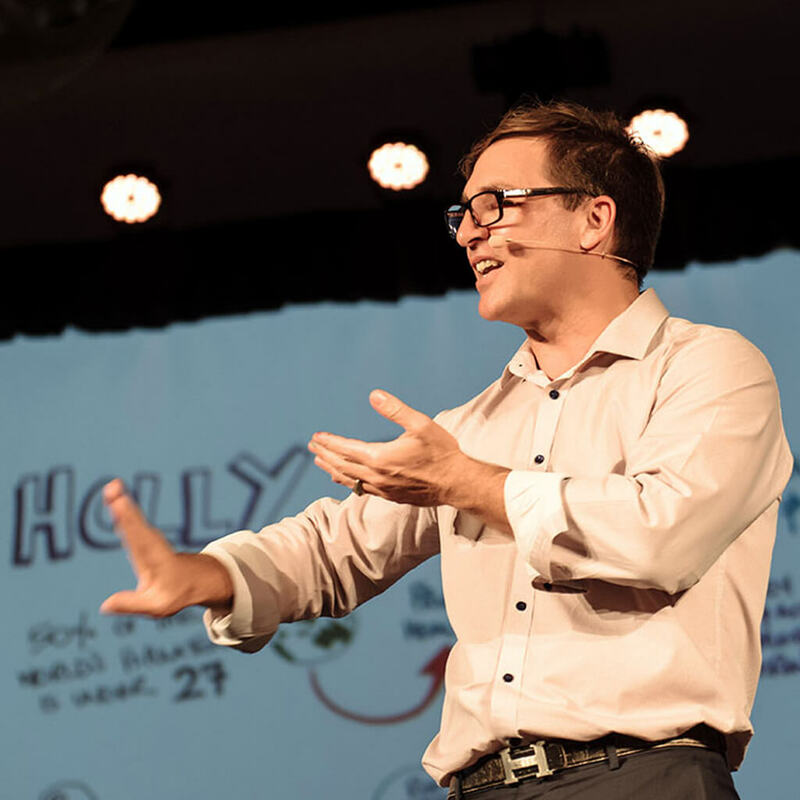 Simon is an author, sought-after speaker and conference MC and has delivered over 1200 events across the globe. His big why? To build a more creative world and empower people to rediscover their long-lost superpowers of creativity, curiosity and imagination – the essential building blocks of innovation. 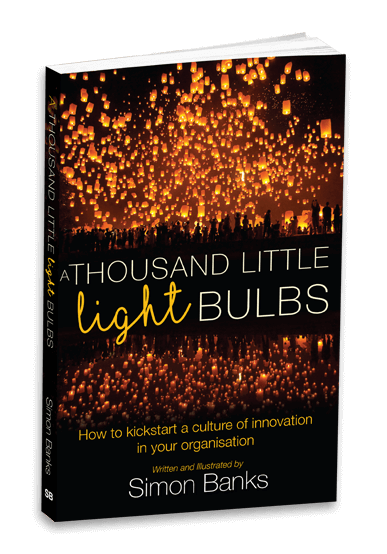 His book A Thousand Little Lightbulbs: How to kickstart a culture of Innovation in your Organisation is out now. Looking for a speaker with the right mix of energy, humour and insight to kickstart innovation and delight your audience? Are you wanting to take your communication skills to another level and truly engage your stakeholders? ♦ Ever thought creativity and innovation were for other people? ♦ Ever rolled your eyes at the latest corporate change roll out? ♦ Do you want to get the best out of your team? Kickstarting a culture of innovation can feel pretty hard. Things might have been the same in your company for a very long time. But times are a changing. Business as usual is NOT the new normal. Innovation’s where the good stuff – and your future - happens. You can’t afford to miss out. Finally, there’s a book for you! "Wow! What an impact our 2 days with Simon has had on our team. The team are constantly thinking outside the square for business improvement ideas and 'acting' more creatively. This is an absolute strength to this team and Sanitarium, and we are already seeing the business results. Well done and we can't wait for our next session in April." "I would like to thank you for your role as facilitator and MC at the Department of Transport and Main Roads DG Customer Led Innovation Challenge. Your role was integral to making the day a success and was greatly appreciated by myself and all the participants." 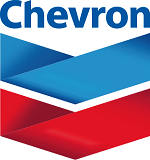 "Ongoing value of the training we participated in with you has been amazing! And the few of us who were a part of the original training group are keen to introduce the other members of our team to the experience we all rave about. Thanks once again for an amazing experience, the best training I have ever done." "I brought Simon into a client site to run a 3-hour workshop for 25 Business Improvement folk on visual facilitation (How-to-do). He was awesome. Super easy to work with, and excellent facilitation of the workshop itself. The next day I walked into a number of rooms where the project teams had taken the skills and their new found confidence and illustrated key messages of their initiatives. It was quite staggering (after only 3 hours!). Weeks later the new skills are still being used and the team is communicating much more effectively with their stakeholders. Highly recommend!" "Simon facilitated and graphically recorded our recent EY Oceania Infrastructure Advisory conference attended by 145 people. Simon had everyone up and interacting with others and kept the positive energy up in the room from the introduction through to introducing all the speakers right through to the end of the second day. I ran into a gentleman attending a conference next door to ours and he asked me if we had a comedian because everyone was laughing and sounded like they were having a great time. He jokingly asked to join in because it sounded like more fun than the event he was attending. I doubt our conference would have been as successful without Simon and everyone loved him, and we have quite a diverse team." "Everyone thought you were great! Your session was fantastic, fast paced and highly interactive and took a different approach to the exploring creativity and innovation with a purpose relevant for the HR team. Most of all you were loads of fun." "Simon is a very talented artist in many ways! And VERY good value - not only do you get someone who can create fabulous visuals of what your presenters are saying that embed the messages but you get a dynamic and interactive MC who can connect those excellent messages!" "The feedback has been nothing short of fantastic. Again thanks Simon for pulling off what will be a memorable night and of course now the bar for next year’s conference is set very high. Great job and really enjoyed working with you." "Simon - you have shown professionalism, skill, creativity and great, great, great humour at both conferences you have facilitated. Watching you captivate an audience is just great." "This is the very best program I personally have ever experienced. Thanks so much Simon, I believe you have found your calling, not just in art and facilitation but bringing a whole bunch of people together that would not normally associate. I couldn't rave about you highly enough. Thanks again for a wonderful experience." "Just wanted to say a huge thank you for work at the conference last week, the day was excellent and the feedback we are receiving about you and the overall day is the best ever! I think you were a great addition both years, you kept the exercises different each time which certainly helped and I think staff were all really happy, particularly the way you managed the event." "I cannot speak highly enough of Simon. He was great at setting the atmosphere and enabling us to connect with our teammates. He kept everyone on their toes and had some great ideas on icebreakers and games without anyone feeling embarrassed about being involved." "I just wanted to say thank you for all of the work you did – before and during the CEO Forum. Simon, you made the day loads of fun for everyone. I am looking forward to finding more wonderful ways we can use your talents going forwards." "Your energy, style and humour was very engaging and enabled the whole team to get in touch with their amazing creativity, to have fun and to step outside their comfort zone. Thank you for making it seem effortless, I really do appreciate how much hard work goes into delivering something that works so well." "I tasked Simon with the job of MC and session facilitator at a national conference for accountants - Not the easiest of audiences, yet Simon’s unharnessed energy ensured the room remained engaged for the entire 3 days. Simon’s is fun, dynamic and forces the listener to move outside their comfort zone (in the right way). I have had the pleasure of working with Simon on numerous occasions and would personally recommend him to anyone seeking a speaker with a difference." "The feedback was fantastic from the conference. Thanks so much for your work with our sessions Simon. You were exceptionally professional, fun and really nailed the brief." "Thanks for an amazing session on human centred design and prototyping Simon. We are still raving about what we learnt... Of course I love any chance to get out the cardboard, scissors and Lego to start building prototype collaborative engagement pieces." "Simon facilitated our inaugural innovation event in September 2016 in Melbourne, where over a dozen teams participated. He brought great energy to the session, engaged the teams very well, coached us along the way, and made the event fun. Simon is a great presenter and facilitator and I would recommend him for other organisations looking to run innovation sessions, hackathons, or similar events." "Simon is one of those rare individuals who can communicate in a board meeting with executives and yet be a wildly creative person. His company is a fantastic fusion of both qualities and is an asset to any conference."